Clingmans Dome map in the Great Smoky Mountains National Park. 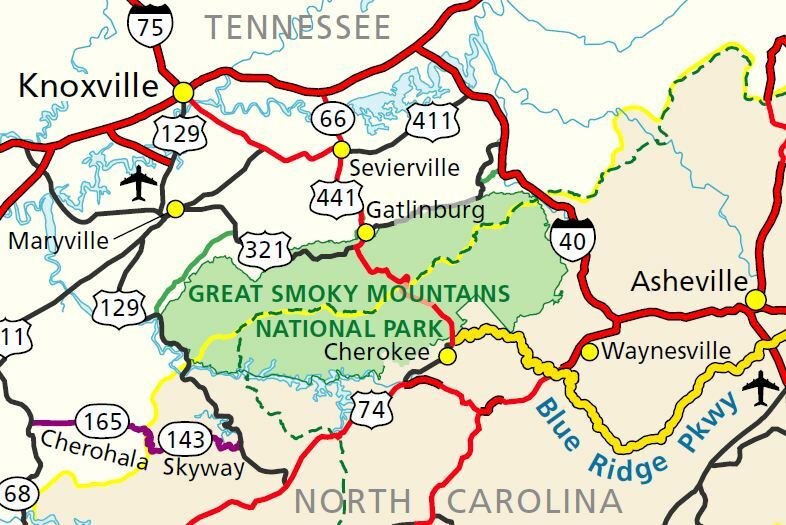 Maps are available at any National Park Service visitor center, such as Sugarlands and Oconaluftee..
Clingmans Dome map located in Great Smoky Mountains National Park. 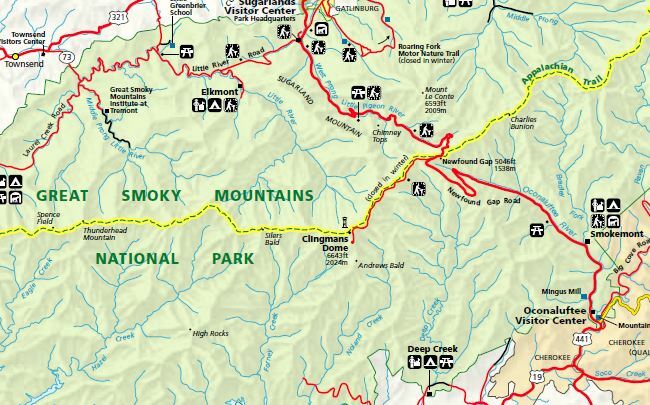 Directions to Clingmans Dome: Turn off Newfound Gap Road 0.1 mile south of Newfound Gap and follow the 7-mile-long Clingmans Dome Road to the large parking area at the end. Clingmans Dome Road is closed in the winter, and occasionally in early spring or late fall depending on weather conditions. The seven mile road to Clingmans Dome is marked near Newfound Gap with brown signs, and is the only intersection in the area. CLingmans Dome Road terminates at Forney Ridge Parking Area just below the summit. There is an Information Center and restroom facilities at the end of the parking area. As a popular destination, the parking area becomes congested on most summer days. An early start avoids the traffic. Clingmans Dome map, located in Great Smoky Mountains National Park.